Following the powder-making development trends, HC1700 grinding mill, with revolutionary and innovative technology, is designed by our engineers who devote great effect to improving the structure and capacity of traditional Raymond Mill. 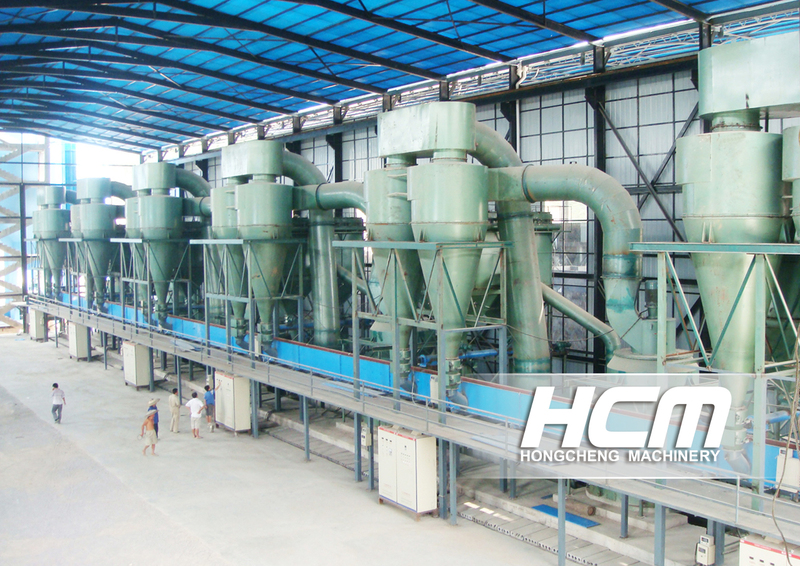 HC1700 grinding mill is a better choice for large scale powder-making projects. It effectively increases the production capacity while reducing the power consumption. Compared to the traditional mill (5R Raymond mill), the capacity of HC1700 grinding mill is about 2.5 to 4 times higher. HC1700 grinding mill is a kind of large powder-making equipment with higher production capacity and efficiency. HC1700 Grinding Mill is a newly developed large-scale roller mill by Guilin Hongcheng. The equipment referenced the operating principle of pendulum mill and improved the swinging method. Without changing other parameter, the centrifugal grinding pressure increased about 35%. The grinding area of roller and ring is improved, the output has 2.5 to 4 times higher than traditional R mills. Applied constraint turbine classifier, production fineness can be adjusted around 0.18-0.022mm (80-600 mesh). At the same time, gearing device and roller assembly sealing are also improved to increase operational reliability and to offer an easier maintenance. HC1700 has the advantages of high capacity, high efficiency, low investment and operation cost and low pollution, it is the best choice of large-scale powder processing. Powder processing system technological process: raw material will be transport to semi-open shed by special vehicle, and then be shoveled into the crusher to be crushed into particles smaller than 40mm. The material particles will be raised to the storage hopper by the elevator and then be evenly sent to the main mill for grinding by feeder. The qualified fine powder will be classified and blew to the pulse dust collector as product and finally discharged from the dust collector. The product will be transported to powder storage. The system is designed as open circuit system with full pulse dust collecting (able to collect 99.9% of the powder), so the equipment has higher capacity and lower pollution. The product can be deep-processed according to actual technology. HC grinding mill has really high capacity so the product cannot be packed by hand-filling, the packing job is supposed to be done after the powder be sent to the storage tank. 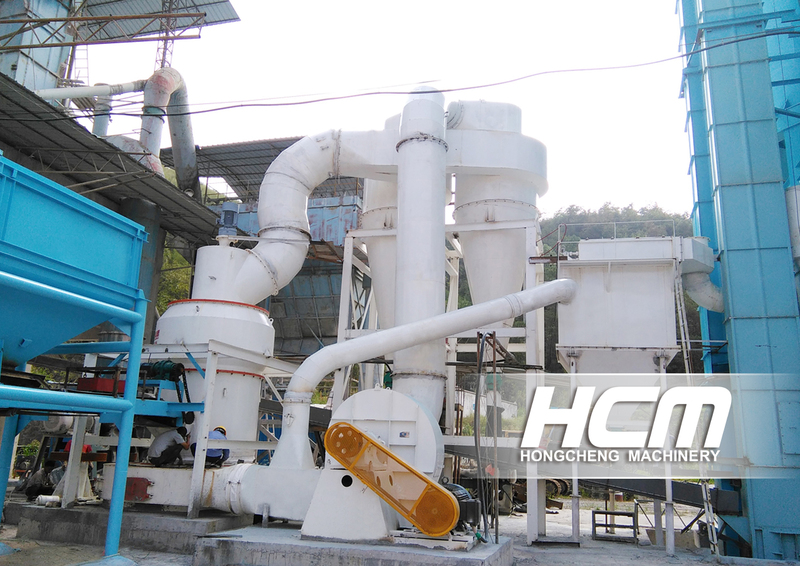 The HC1700 grinding mill is widely used to grind almost any non-metallic minerals with Moh's scale of hardness below 7 and moisture below 10%, such as limestone, calcite, activated carbon, talc, dolomite, titanium dioxide, quartz, ceramic, bauxite, marble, feldspar, barite, fluorite, gypsum, ilmenite, phosphorite, clay, graphite, kaolin, diabase, gangue, wollastonite, quick lime, silicon carbide,bentonite, manganese etc. The fineness can be adjusted from 0.18mm(80 mesh) to 0.038mm(400 mesh), whose range is much wider than that of traditional raymond mill. HC 1700 Grinding Mill consists of main mill, constraint turbine classifier, pipe system, high pressure blower, double cyclone collector system, pulse air collector, feeder, electronic control motor and jaw crusher, pan elevator. The main mill consists pedestal, return air box, shovel, roller, ring, housing and motor. The roller and ring are cast by wear-resistant material. Double gearing device and reducer device can be applied in the power unit of the whole system. 2.The capacity is for limestone powder, and specification is just a reference. The actual production depends on these materials being processed. (1) HC1700 Grinding Mill following the powder processing development trends, HC1700 Grinding Mill, with revolutionary and innovative technology, is designed by our engineers, it is the most popular equipment in powder processing industry. Over the years, the marketing shows that HC1700 is a reliable, low cost and low pollution equipment. (2) Advanced and reasonable structure of unique swinging pattern (Patent No.CN200720081221.1), new spider-arm and pendulum roller device. The equipment operates in low vibration and low noise. (1) Single machine capacity can reach 25t/h, equal to 6 sets of 4R mills, while the energy consumption is 1/4 lower. The development of HC1700 is the first revolution of large-scale Raymond Mill. (2) Turbine Classifying System（Patent No.ZL201030143470.6）: The classifying system uses the turbine classifier featuring in higher production capacity and more efficient classifying, which can make powder with a precise fineness ranging enlarge from 80-325mesh to 80-600mesh and ensure the highest passing rate. (4) Applied offline pulse dust collector or pulse-jet collector (Patent No.CN200820113691.6), high capacity of dust removing, long service time of filter bags. 99.9% of the powder can be collected. The sealing for the mill ensures no powder floating in the workshop, so the equipment is more suitable for high dust concentration and high moisture site. (5) 20-30dB lower noise than ball mill. (1) Multi-layer blocking sealing structure（Patent No.CN200820113450.1）: The roll assembly works in high dust concentration environment. The lamination sealing of the traditional R type roller mill sealed bearings unreliable. While this proposal adopted with multi-layer blocking sealing structure which combined with the floating oil sealing technology, screw seals and skeleton seals to prevent dust going into the bearing. Keep the roll assembly working smoothly and durable. Vastly short the maintenance time. 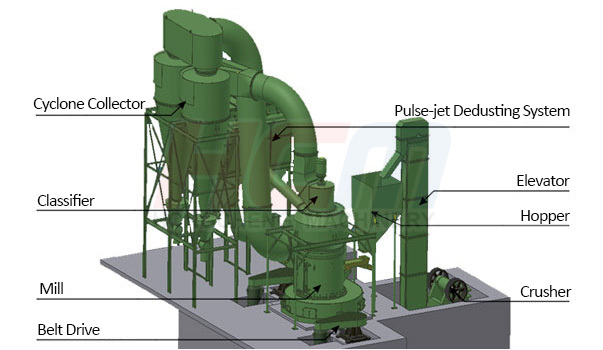 The traditional R type roller mill needs lubrication each 1-2 days. The newly designed sealing structure ensures the roller assembly works continuously for 500-800 hrs without lubrication. (2) Applied frequency control and can be operated by PLC, realized unmanned operation and save up label cost. Customers can also choose long distance intelligent monitoring system to control the operation state. (3) Applied high quality steel to produce important parts, applied high performance wear-resistance material to cast wear-resistant parts, so the whole equipment has high wear-resistant performance and long service life. (4) Unique double belt drive device (Patent No.CN200820104043.4): Grinding mills are working in bad condition, large material or hard matter may cause damage to the reducer and lead to long time maintenance. But the double belt drive has simple structure and is able to offer reliable operation and easy maintenance. (1) The equipment has strong systematic because it can organize an independent and complete production system of raw material crushing, transporting, grinding to production collecting, storing and packing. The grinding mill is in stereo-chemical structure, consume small floor space (1/3 floor space of 4R mill under same capacity), largely reduce construction cost. (2) High applicability, need not to change any parts before processing different material or fineness.